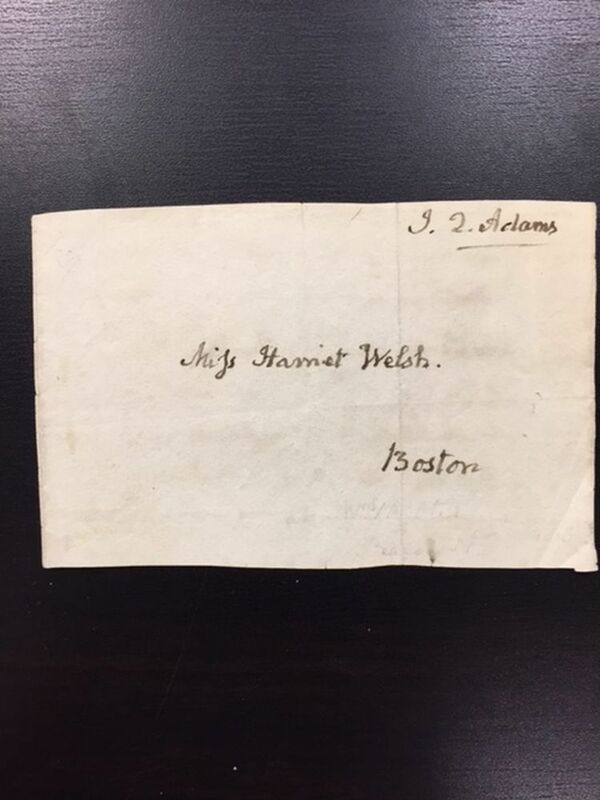 Adams, John Quincy (1767-1848) Autograph Letter, 26 March 1799. 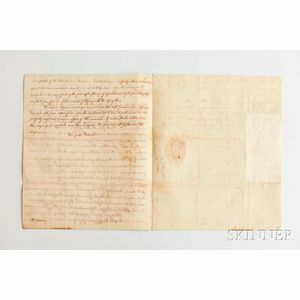 Adams, John Quincy (1767-1848) Autograph Letter, 26 March 1799. 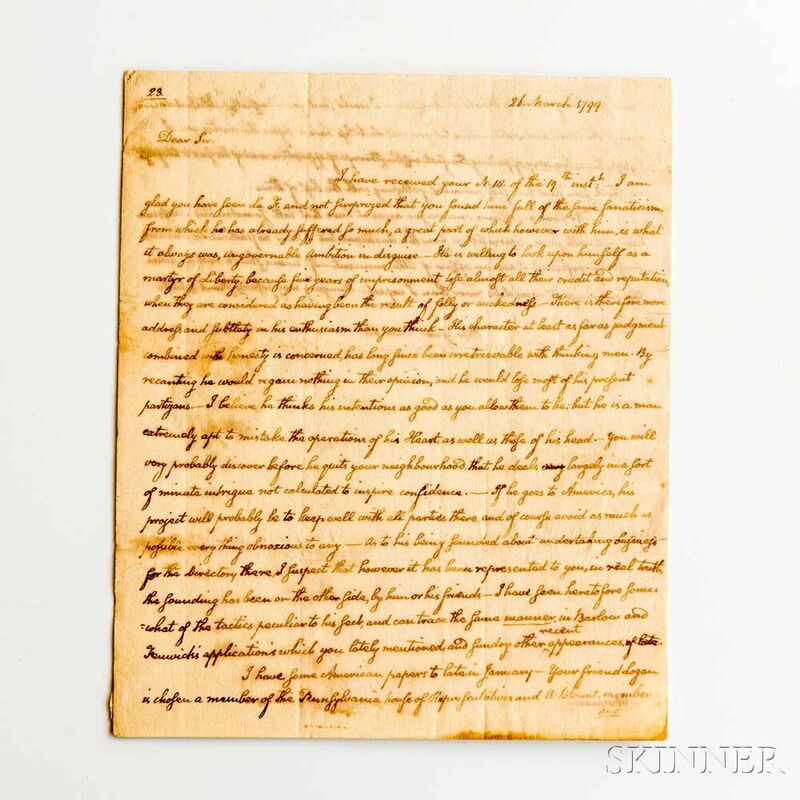 Adams, John Quincy (1767-1848) Autograph Letter, 26 March 1799. 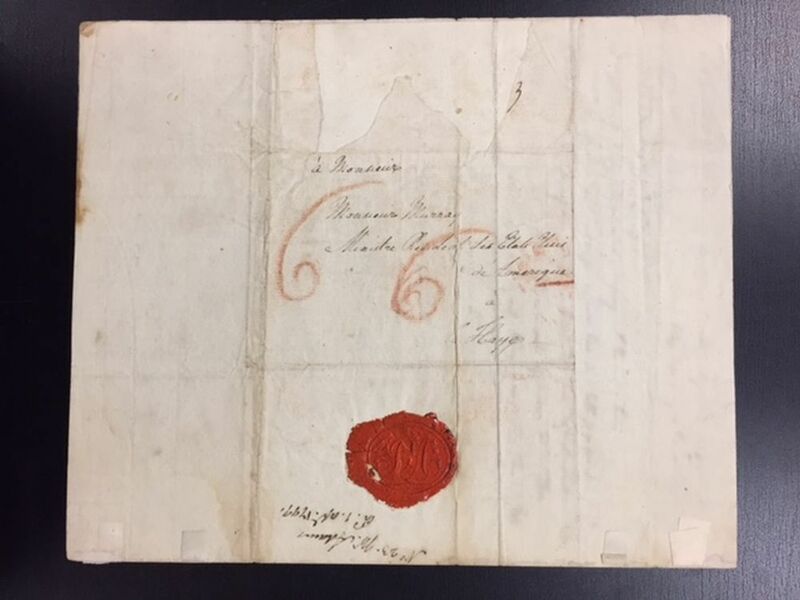 Adams, John Quincy (1767-1848) Autograph Letter, 26 March 1799. 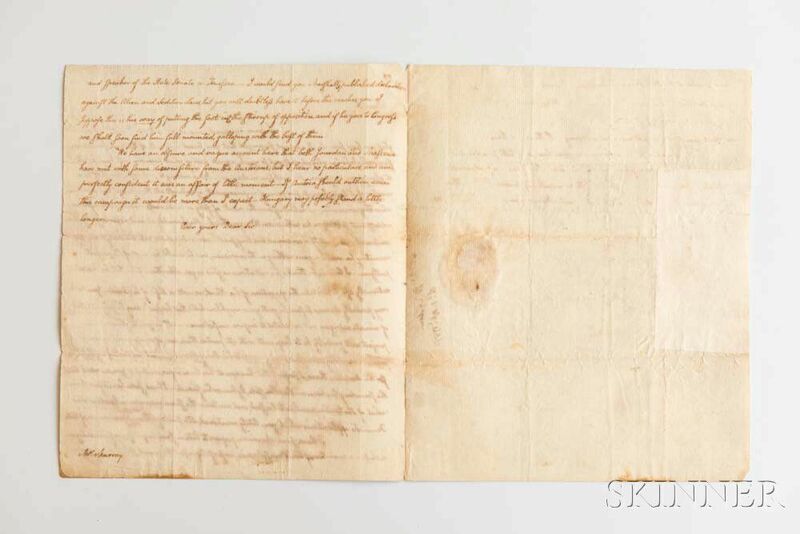 Adams, John Quincy (1767-1848) Autograph Letter, 26 March 1799. 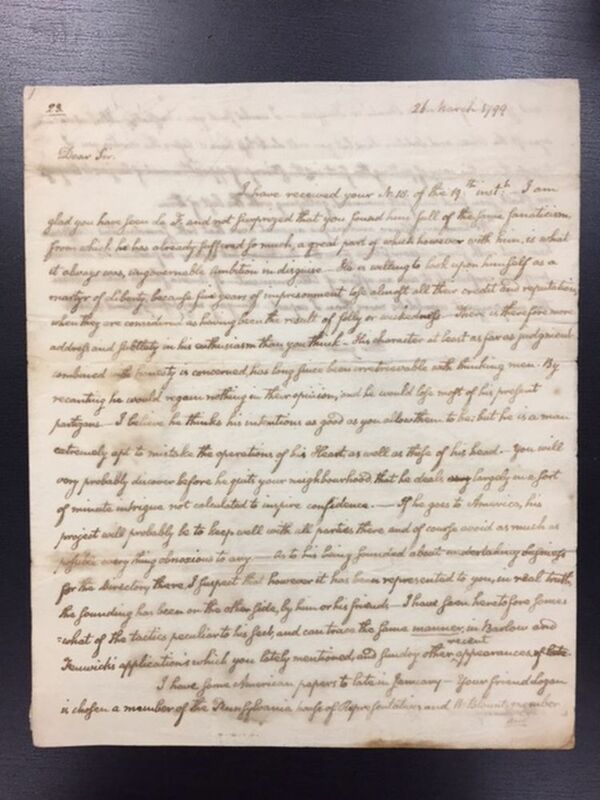 Adams, John Quincy (1767-1848) Autograph Letter, 26 March 1799. 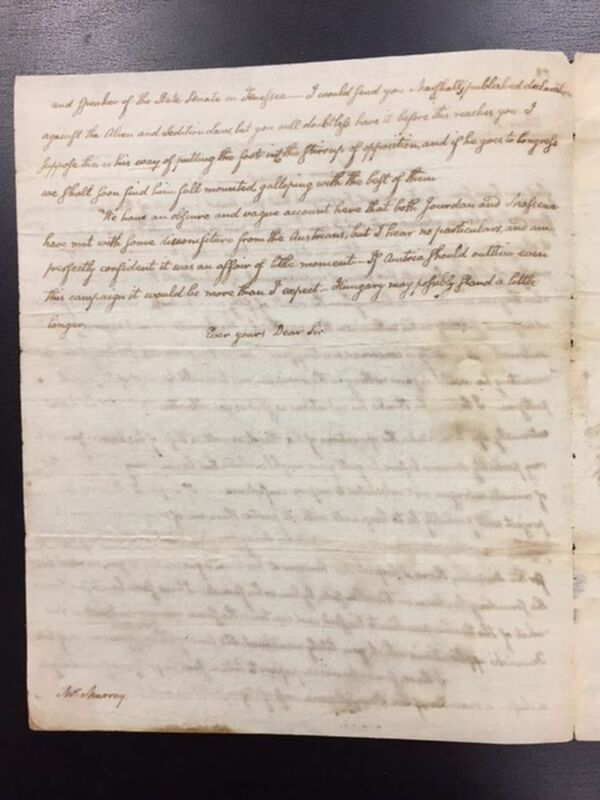 Adams, John Quincy (1767-1848) Autograph Letter, 26 March 1799. 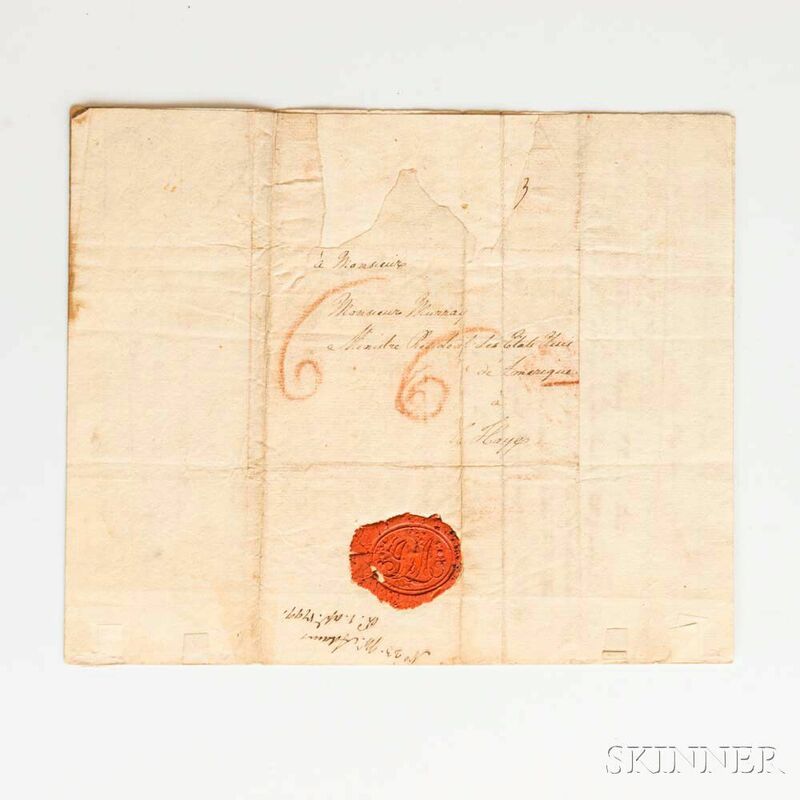 Quarto-format laid paper bifolium with self-envelope and intact wax seal inscribed over one and a half pages. To William Vans Murray (1760-1803), United States Ambassador to the Netherlands (1797 to 1801), in the Hague, from Adams while he served as U.S. Minister Resident to Prussia (1797 to 1801), expressing opinions on the Marquis de Lafayette (1757-1834); calling him "a martyr of liberty," relaying news of elections to the Pennsylvania and Tennessee state legislatures, mentioning John Marshall's (1755-1835) published declaration against the Alien and Sedition Laws, and the instability of Austria. Show through, and some damp staining, purchased from Harry F. Marks in New York in the 1930s, with description, 9 1/4 x 7 1/2 in. "I am glad you have seen La F[ayette], and not surprised that you found him full of the same fanaticism from which he has already suffered so much, a great part of which, however, with him is what it always was, ungovernable ambition in disguise. He is willing to look upon himself as a martyr of liberty, because five years of imprisonment lose almost all their credit and reputation, when they are considered as having been the result of folly or wickedness. There is therefore more address and subtlety in his enthusiasm, than you think. His character, at least as far as judgment combined with honesty is concerned, has long since been irretrievable with thinking men. By recanting he would gain nothing in their opinion, and he would lose most of his personal partisans. I believe he thinks his intentions as good as you allow them to be, but he is a man extremely apt to mistake the operations of his heart as well as those of his head. You will very probably discover before he quits your neighborhood, that he deals largely in a sort of minute intrigue not calculated to inspire confidence."